I received the following story in today's email ... (Thanks, Lois) In 2003, police in Warwickshire, England, opened a garden shed and found a whimpering, cowering dog. It had been locked in the shed and abandoned. It was dirty and malnourished and had clearly been abused. In an act of kindness, the police took the dog, which was a Greyhound female, to the nearby Nuneaton Warwickshire Wildlife Sanctuary, run by a man named Geoff Grewcock and known as a willing haven for animals abandoned, orphaned or otherwise in need. Geoff and the other sanctuary staff went to work with two aims..to restore the dog to full health and to win her trust. It took several weeks, but eventually both goals were achieved. 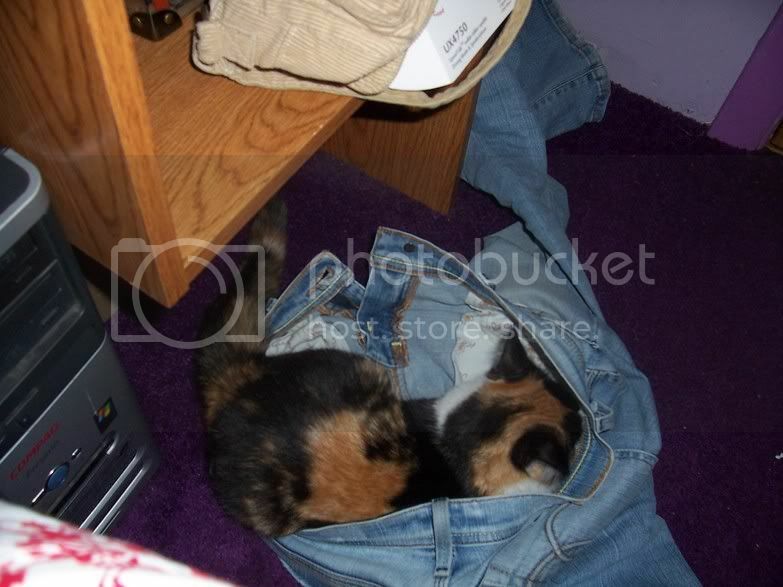 They named her Jasmine and they started to think about finding her an adoptive home. But Jasmine had other ideas.. No-one remembers now how it began, but she started welcoming all animal arrivals at the sanctuary. It wouldn't matter if it was a puppy, a fox cub, a rabbit or any other lost or hurting animal, Jasmine would peer into the box or cage and, where possible, deliver a welcoming lick. Geoff relates one of the early incidents. "We had two puppies that had been abandoned by a nearby railway line. One was a Lakeland Terrier Cross and another was a Jack Russell Doberman Cross. They were tiny when they arrived at the centre and Jasmine approached them and grabbed one by the scruff of the neck in her mouth and put him on the settee. Then she fetched the other one and sat down with them, cuddling them." "But she is like that with all of our animals, even the rabbits. She takes all the stress out of them and it helps them to not only feel close to her, but to settle into their new surroundings. "She has done the same with the fox and badger cubs. She licks the rabbits and guinea pigs and even lets the birds perch on the bridge of her nose." Jasmine - the timid, abused, deserted waif, became the animal sanctuary's resident surrogate mother, a role for which she might have been born. The list of orphaned and abandoned youngsters she has cared for comprises five fox cubs, four badger cubs, 15 chicks, eight guinea pigs, two stray puppies and 15 rabbits. And one roe deer fawn. Tiny Bramble, 11 weeks old, was found semi-conscious in a field. Upon arrival at the sanctuary, Jasmine cuddled up to her to keep her warm and then went into the full 'foster mom' role. Jasmine, the greyhound, showers Bramble, the Roe deer, with affection and makes sure nothing is matted. "They are inseparable," says Geoff. "Bramble walks between her legs and they keep kissing each other. They walk together round the sanctuary. It's a real treat to see them." Jasmine will continue to care for Bramble until she is old enough to be returned to woodland life. When that happens, Jasmine will not be lonely. She will be too busy showering love and affection on the next orphan or victim of abuse. From left - Toby, a stray Lakeland dog; Bramble, orphaned Roe deer; Buster, a stray Jack Russell; a dumped rabbit; Sky, an injured barn owl; and Jasmine, with a Mothers heart, doing best what a caring Mother would do. Today, Monk (or Quaker) parakeets comprise the largest group of the nine species of parrots known to live in the wild in the United States. But their success in establishing an ecological niche for themselves didn't come easily. The birds, Myiopsitta Monachus, originate from South America. A government-sponsored program in Argentina managed to kill more than 400,000 of them in the late 1950s and early 1960s. But in the mid 1960's, someone had a bright idea: instead of killing them, why not ship them to the U.S.A. and make a few extra dollars? More than 60,000 wild parrots were shipped from South America to the U.S.A. during the 1960s and early 1970s. Brooklyn has a large population of these wild parrots and many theories as to how the birds first were released into the wild. In 1973, the Federal Government became aware of the parrots' existence in the New York area, and sent out SWAT-style eradication teams which captured many birds and shot those unwilling to surrender. One of the last remaining parrot strongholds, a nest complex on Rikers Island, Queens, managed to survive the eradication teams and are the probable ancestors of the parrots alive today all over Brooklyn. These intelligent, non-aggressive birds, which no self-respecting scientist has ever claimed have caused any significant crop damage in the U.S., are regarded with extreme hostility in many states. In New Jersey and Connecticut, they are classified as a "potentially dangerous species." In Pennsylvania, they are reportedly euthanized on the spot whenever power companies find them nesting on transmission lines. In Florida, both the state Department of Transportation and the Florida Power & Light utility company do the same thing. Florida Power & Light has for years maintained secret gas chambers where captured parrots are killed en masse. Stephen Carl Baldwin, at Brooklyn Parrots, writes, "The fact that North America has a new parrot on its shores is in my view a blessing, especially because our countrymen wiped out our only native parrot - the Carolina Parakeet - nearly a hundred years ago. Nature has given us the rarest of gifts: a second chance." Source Yes - we do have Monk parakeets in Illinois! 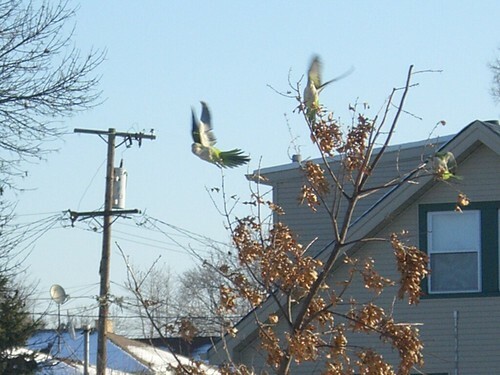 There are monk parakeet colonies in nearly 20 Chicago suburbs. I took the following photo in Alsip, Illinois, on December 6, 2006. It was 8:30 am, temperature was 36 degrees. There were about a dozen of these gorgeous, vivid green birds at 116th and Springfield.